Another of the shops on my list to visit during my recent trip to London was Phulkari. They're a fairly new shop (I think they opened in February this year) but they caught my attention because like Onitaa, they stock Indian and Pakistani designers. 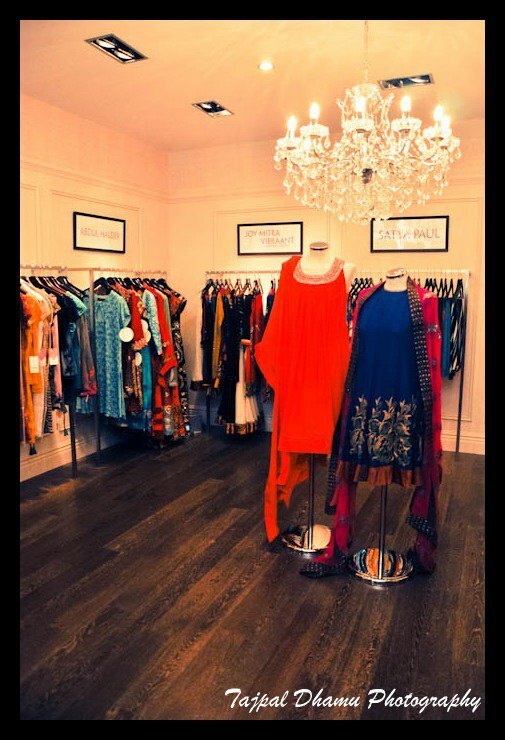 However unlike Onitaa which is miles away from any other asian shops and is aimed at the super-rich, Phulkari is on Ilford Lane, amongst the likes of Gul's Style and RDC and is a lot more accessible to the likes of you and me. I visited on a Sunday morning/early afternoon so it was quiet and we had the whole shop to ourselves to browse. It's not massive inside, but it didn't feel claustrophobic (like some of the shops which have back-to-back rails of clothing everywhere) everything was nicely spaced out and easy to look through. I had quite a specific reason for visiting Phulkari that day - I wanted to buy a Satya Paul sari. I emailed the store in advance to find out their price range (starting at £130 for the crepe saris to £480 for the embroidered saris) so I had an idea in my head of how much I wanted to spend, the next part was to find the right sari for me! The photo above was taken at the store launch in February, so the Satya Paul collection was somewhat smaller when I visited in May. I found a few designs that caught my eye and the staff were happy to open them up for me and let me see all the detail. They even checked for any they had in stock which weren't out on the shop floor. I narrowed my choices down and after trying on (with the help of an assistant - because no way can I drape a sari myself! 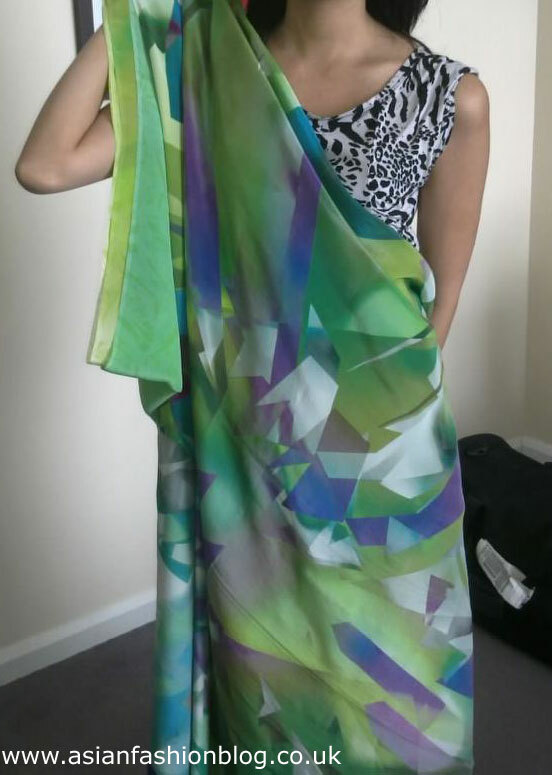 ), I settled on a green, blue and purple print for £180. This is me holding it up against myself in our hotel afterwards - the blouse (which comes unstitched) is a plain purple colour although when I showed this pic to my sisters they thought it looked good with the animal print top I was wearing underneath. I was very pleased with my purchase and afterwards out of curiosity I went to the Satya Paul website to see how much it would have cost to buy online direct from them. I found a different colour variation of this outfit for 9,995 Indian Rupees plus 1,000 for international shipping. Indian Rupees don't mean anything to me, but a currency covertor put 10,995 rupees at £151.53. So technically I could have saved myself £30 by getting it direct, but I'm happy to pay that for being able to see it in person first, try it on, and to be able to walk out of the shop with it there and then rather than worry about it getting lost in the post. I will definitely be going back and shop at Phulkari London, and according to their most recent facebook status, they'll be getting some more Satya Paul stock in soon, including the recent Jewels of The Sea collection. Photo credits go to Tajpal Dhamu Photography, originally posted on the Phulkari London facebook page.